WordPress is our platform of choice for building websites. We recommend Magento for most eCommerce stores, and use WordPress for all other websites. 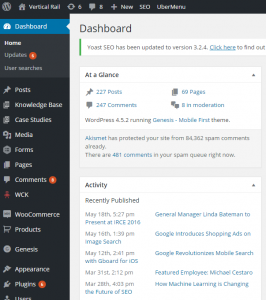 WordPress began as open source software, and then evolved into its hosted version. WordPress.com allows you to start a blog or build a website. There are three plans you can choose from. The Free plan gives you a custom address (blog.wordpress.com), access to free themes, 3GB of storage space, and allows for unlimited pages and blog posts. The Premium plan provides all of the same features; plus it allows you to use your own custom domain, up to 13GB of storage, and advanced design customization. The Business plan provides everything in the Premium plan, but offers unlimited storage space and Google Analytics integration. It is relatively easy to get started with. If you would like to upgrade your current site or build a new site altogether, contact us regarding our website design and development services.